The Cal-IPC Student Section is dedicated to expanding opportunities for students interested in invasive plant research and management. We serve as a voice for students within Cal-IPC and work to connect them with each other as well as with professionals. As a part of Cal-IPC’s mission to protect California’s wildlands from invasive plants now and in the future, we need the next generation of weed warriors to get involved! 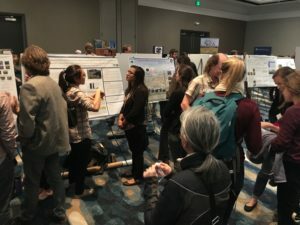 Whether you’re a current student, recent graduate or early career professional, if you are interested in land management and invasive speices, join our student mailing list to hear about internship opportunities, student funding, and symposium-related events! 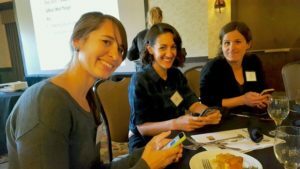 Most of our events take place at the annual Cal-IPC Symposium. Each year, we organize a variety of networking events including a Career Panel for students to learn more about careers in weed management with representatives from a variety of fields including non-profits, academia, consulting and the government. We also kick off every symposium with a Student Mixer to bring together all the students at the conference. In addition to these events, there are also various funding opportunities and awards available to our student members. We started offering Student Travel Awards in 2017 to help offset travel and registration fees; we look forward to offering these every year. Students can also compete for cash prizes by participating in the annual Student Paper and Poster contests. Looking for research opportunities, seasonal work, internships, or more permanent opportunities in the field of invasive species and restoration? Check out current opportunities across California now on our Job and Internship Board, updated weekly! 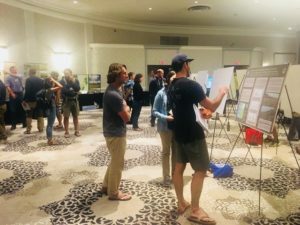 A very busy poster session during the 2018 Cal-IPC symposium. 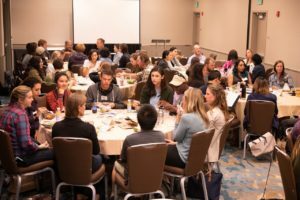 Intense discussion between professionals and students during the Early Career Networking Lunch. When applying for a job with the government tailor your resume for each position, and include an original cover letter, CV are optional. Once you are employed it is easier to promote to another position, so just get your foot in the door. Hannah also mentioned the importance of having patience when seeking local government jobs it may be necessary to contact the HR department through the county website and fill out a job interest card for the Job Classification listed on the website that you are interested in, even if that job is not currently posted. Korie encouraged new professionals to put themselves out there and not be afraid to stand out, as these are the people who are remembered and often called for interviews. When interviewing for a non-profit job, it is OK and normal to discuss funding sources, for example how far future funding will last, and whether the project you are considering is funded by “hard” (revenue) or “soft” (grants and donations) money. Being a part of a non-profit has allowed her to tap into a network of diverse organizations where she has shadowed experts in fields less familiar to her and reached out to others for assistance and advice on project directions. Tim Buonaccorsi, Botanist, RECON Environmental, inc.
Tim advised young professionals seeking a career within the industry to contain a few keys skills such as, plant identification of both native and non-native species, adequate verbal and writing communication, and basic field data entry. Tim Buonaccorsi, Associate Botanist, RECON Environmental, inc.
Tim currently acts as manager of northern California operations at RECON Environmental, Inc. in Berkeley, CA. Since graduating from Humboldt State University with a B.S degree in Botany, Tim has been managing habitat restoration and weed treatment projects for over 9 years. His experience includes working in landscapes ranging from The Algodones Sand Dunes near Yuma, Arizona to the great basin sage scrub near Mono Lake, CA. Dr. Milan Mitrovich’s background is in conservation science, with an emphasis in landscape and wildlife ecology. Over the last 12 plus years, Milan has served in research and advisory roles for several public and private sector organizations, including Solution Strategies, Inc. an environmental consulting and strategic advisory firm based out of Los Angeles; Western Ecological Research Center of U.S. Geological Survey; and Orange County Great Park Design Studio. In his current position, as Science Director for Natural Communities Coalition, Dr. Mitrovich works with the organization’s directors and officers as well as representatives from partnering organizations to direct and fund science and management initiatives associated with protection and recovery of sensitive plant and animal species found within a 208,000-acre planning area in coastal and central Orange County, California. Milan holds a B.S. in Ecology, Behavior, and Evolution from University of California, San Diego, and a Ph.D. in Ecology from University of California, Davis, and San Diego State University. Hannah Wallis holds the position of Agricultural Programs Biologist for the Monterey County Agricultural Commissioner’s Office. This is a multidisciplinary applied biologist position in charge of Plant Pathology, Entomology and Invasive Plant Management on behalf of the Commissioner. Specifically, she screens seed crops for export, ensures the host cycle is broken for significant agricultural pathogens of local commodities, identifies pests, runs the invasive plant management program, runs the Monterey County Weed Management Area, helps plan the Central California Invasive Weed Symposium and acts as a scientific resource and liaison to the department, public and outside agencies, among other things. Hannah holds a Bachelor of Science degree in Ecology and Evolutionary Biology from the University of California at Santa Cruz and 9 specialized state and federal certificates and licenses required to work for the Agricultural Commissioner in this capacity. Jennifer Funk is an Associate Professor of Biological Sciences at Chapman University. Her research focuses on identifying characteristics of invasive plant species and using that information to restore native plant communities. She is particularly interested in how invasive species out-compete native species for resources in arid and nutrient-poor habitats. She has worked extensively in Hawaii and all five Mediterranean-climate ecosystems. Gina is a Senior Environmental Scientist Supervisor in the Division of Environmental Services at the California Department of Water Resources (DWR) in Sacramento with over 10 years of experience working on invasive plant management in California. As part of her duties at DWR she oversees technical staff dedicated to the Fish Restoration Program and California WaterFix. Gina serves as co-chair to the DWR internal Invasive Plant Working Group and represents DWR on the Delta Interagency Invasive Species Coordination Team, the Interagency Ecological Program’s Aquatic Vegetation Project Work Team, and the California Interagency Noxious and Invasive Plant Committee. Prior to working for DWR, Gina worked at the CA Department of Food and Agriculture in the Weed Management Area (WMA) Program. She has a B.S. in Marine Science from Eckerd College, St. Petersburg, FL and an M.S. specializing in Weed Science with Dr. Joe DiTomaso from UC Davis (2008). Eric is a Plant Ecologist/Botanist, for Golden Gate National Recreation Area, CA. He has over ten years experience in vegetation resources in California. Congratulations to our 2018 Student Travel Award winners Rebecca Serata (UC Davis), Madeline Nolan (UC Santa Barbara), Michala Phillips (UC Riverside), Jade Blennau (Stony Brook University), Mika Hozawa (Kyoto University), Lindsay Marks (UC Santa Barbara), and Temitope Borokini (University of Nevada, Reno). Looking forward to hearing about your projects at the Symposium! Get ready for the 2018 Cal-IPC Symposium! Do you have a topic to present? Join us in Monterey, November 7 – 10, and share your research. Abstracts are due June 1st. This year the Student Section will be offering Travel Awards to offset costs for attendance as well as monetary awards for top Student Talk and Student Poster. We will also be holding a Student and Early Career Professional Networking Lunch. Check back soon for more details on Student Section events and award deadlines and go to the Symposium page to submit an abstract! We just launched a job and internship board full of current opportunities in the fields of invasive species and restoration research and management! We’ll be updating it weekly. We welcome Guy Hernandez and Marlee Antill, both Master’s students at Cal Poly Pomona, on board as a Student Liaisons. Look out for us at the upcoming CNPS conference in LA at the end of the month! Students gather at the 2017 Symposium to review and discuss posters. Jennifer Funk, Associate Professor at Chapman University. Panelists talked about work-life balance, skills necessary to obtaining a job in their respective organizations, the two-body problem, and the winding path that took them from graduate school into their current careers. For a full list of past Student winners, visit the Symposia Awards page. We welcome Noah Teller, PhD student at UC Riverside, on board as a Student Liaison. We look forward to working with you to expand our student section!